An unusual cast has assembled at Cuesta College’s University Art Gallery. Odysseus is there, tardy and travel-weary. Dr. Faustus is, too, sin-ridden from his bargain with Lucifer. Scholars of Shakespeare are adrift in one corner. A corps of molded bees going about their business of pollinating descends from the ceiling. The Library of Alexandria, four times consumed by flames, has been resurrected in the small, white space, if only through invocation. The person responsible for this rice-paper shrine is none other than Canadian artist Linda Carreiro, a bibliophile. And, some might argue, desecrator of books. Carreiro’s exhibit at the gallery, “Carried Across,” is on display through Sept. 16 and addresses her preoccupation with the concept of translation. “When I say translation, I don’t just mean English to Spanish,” said the installation artist, an assistant professor in the Department of Art at the University of Calgary. Instead, Carreiro is interested in how such standard practices as revising and editing a text alter its meaning. Or how a cultural gap between author and reader—created by both time and geography—interferes with the reader’s interpretation. It’s as if an author is casting his or her work out to sea, and the hour and weather that mark this release determine the condition of the text’s arrival. Specifically, Carreiro elected to examine this phenomenon through the works of writers considered to be of monumental import. It takes four days of labor to install one of Carreiro’s exhibits. 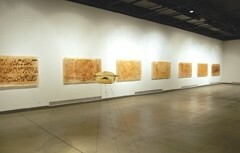 She began her current body of work at the end of 2007, with a series of images called “Library of Alexandria.” The series consists of four panels, layers of rice paper treated with lemon, sugar, and varnish and fired with a heat torch to produce a burnt effect that suggests the cause of the library’s demise; she kept a bucket of sand and damp cloth on hand, should the torching get out of hand. The effect of her labors is a sweet, crisp texture resembling a hard crème brulee shell. The panels are alive with sketches, texts, and theorems, all in brown ink. Copernicus’ theories about the Earth’s navigation around the sun overlay Ptolemy’s text, constellations labeled Leo minor and Orion reaching across the paper, like oxygen bubbles allowing the paper to breathe. Carreiro punctured a line of Braille across the bottom of one piece. She sketched a ship from The Odyssey onto one panel, along with arches from the library that is the title of her series. On the opposite wall, Carreiro wrote the first line from The Odyssey, in Braille, with circles of text she punched from The Odyssey and The Iliad. DREAM BOAT: “Carried Across: New Work by Linda Carreiro” will be on display at the Cuesta College Art Gallery through Sept. 16. Gallery hours are 11 a.m. to 4 p.m. Monday through Friday. The Alberta Foundation for the Arts provided funding for travel expenses related to the exhibit. After Homer comes Shakespeare, and the piece that most embodies the show’s message, “Scholia.” Carreiro printed one of the bard’s plays onto Japanese rice paper treated with linseed oil and shellac, creating a large book that occupies the gallery’s floor. Except that Carreiro removed the majority of the text, reducing the book to the scholarly notations along the bottom. In this case, the boat is literal. 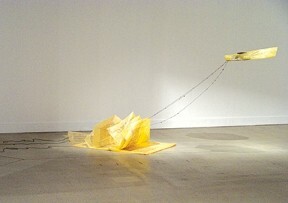 Made from—what else?—rice paper and stitched with hemp string, a rowboat is suspended several feet from the floor, twin paddles resting against its seat. Black glyphs and numerals, alphabet pasta in a former life but now charred, are piled into the vessel. Three strands of black string link the airborne rowboat to the book below, its pages deliberately curled and roiled like a wave. It’s a visual metaphor for the concept of being carried across innumerable translations, revisions, and cultural barriers. Her later pieces became even more layered with meaning as she began, literally, to carve into the books she admired. The first was a copy of The Child from the Sea, old and worn, which she opened and carved into a wave. It was intended to be a practice run, but Carreiro was so pleased with her first wave book hybrid that she incorporated it into her body of work. Waves, she reasoned, have an effect not unlike translation. “Every time they go over they cover something up but they reveal things on their way back,” she said. The final two pieces, another book carving and bumblebees, were made specifically for her exhibit at Cuesta. In a feat that a passerby compared to surgery, Carreiro carved a Spanish galleon from a copy of Don Quixote. The paper ship rests on the book from which it was liberated, dainty and precise. The endeavor involved time, planning, and extra copies of the book so she could take a trial run. Carreiro acknowledges that it initially felt sacrilegious to wield a knife against a book. But she reasoned that she was using texts that had been printed many times and the act posed worlds of possibilities for her art. In the future she’s considering removing covers and spines and reversing the order of the plot and text. Her final piece, completed the night before she left Canada for San Luis Obispo, was a series of cast bumblebees suspended from the ceiling, landing on a copy of Dr. Faustus. She wanted to explore the concept of pollination, how one author influences another, and even how a reader’s experiences inform their reading of a particular text. Like nature, where plant and insect life support and sustain one another, literature builds upon itself. The bumblebees will likely propose new works and ideas for Carreiro. The artist’s comment on the malleable nature of text, even that of such immoveable literary pillars as Shakespeare, Marlowe, and Homer, is not a critique nor judgment. Just as her book dissections are conducted without malice. The materials she works with have a language all their own, Carreiro reasons, aware that meaning doesn’t spring solely from text. Arts Editor Ashley Schwellenbach knows that the heft of a book is more valuable than the glint of a diamond. Send three-carat literary works to aschwellenbach@newtimesslo.com.